Metis leader, MP (1872-1873), MP (1874-1878). Born at St. Boniface in the Red River Settlement on 22 October 1844, eldest of eleven children of Louis Riel, Sr. and Julie Lagimodière (1822-1906), at the age of seven he was sent to the school conducted by the Grey Nuns in St. Boniface, and in 1854 to the school operated by the Christian Brothers. In 1858 he was selected by Bishop Taché to be educated in Eastern Canada. He attended the College of Montreal until 1865 when he withdrew, possibly because of romantic problems. He left Montreal and worked in several American cities before returning to the Red River Settlement in 1868. His direction of the Red River Rebellion was for the most part brilliant, marred only by the execution of the Orangeman Thomas Scott, which enabled the Canadian government to turn him into an outlaw. Riel fled the Settlement in August 1870, with the arrival of the Wolseley expedition. Although elected to represent Provencher constituency in the Canadian House of Commons in 1873 and again in 1874, he was not permitted to take his seat. In 1875 the Governor-General granted a general amnesty to Riel on the condition that he remain in exile for five years. Unhappy and frustrated in the United States, Riel was committed to the St. Jean de Dieu Asylum at Longue Pointe in 1876, and several months later to the asylum at Beauport, where he remained until 1878. He eventually returned to the American West, settled in the Territory of Montana, and applied for American citizenship in 1883. In June 1884 he was asked by a group of settlers in the Saskatchewan Valley to lead them in protest against the Canadian government. The outcome of his return and agitation was the North-West Rebellion of 1885. Following the defeat at Batoche, on 15 May, Riel surrendered to General Middleton. He was tried for treason, rejecting a plea of insanity advanced by his lawyers, and was hung at Regina on 16 November 1885. On 12 December 1885 Riel was buried in the St. Boniface Cathedral Cemetery. He is commemorated by Riel Avenue in Winnipeg, and by Louis Riel Day, a statuatory holiday in Manitoba celebrated on the third Monday of every February. Five volumes of Riel’s papers, which demonstrate his prose style and his competence as a poet, have been edited by George F. G. Stanley and others. The best biographies are by Stanley, Thomas Flanagan, and Maggie Siggins. 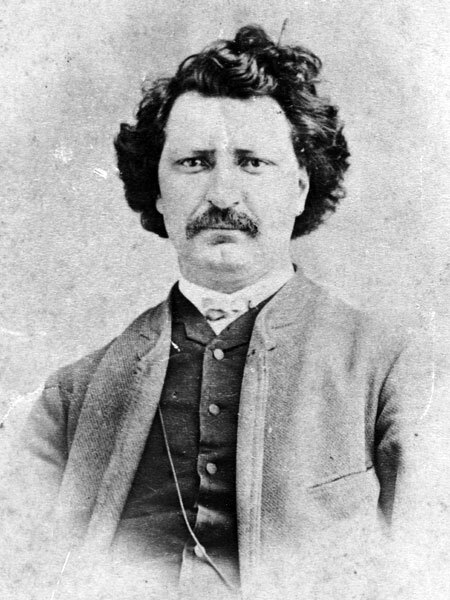 Louis Riel, Dictionary of Canadian Biography XI, 736-52.